Where do our differences come from? 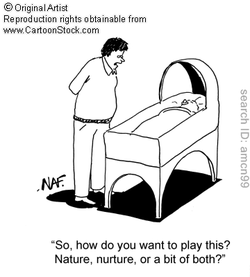 One of the big debates in psychology is the nature-nurture debate. It asks the question about whether our DNA (our genes) or our environment create differences. In Psychology, there is a lot of interest in intelligence, gender (identity and orientation) and criminal behaviour. To get us started, watch this clip and see if you can identify the examples that belong to the nature side of the debate and those that belong to the nurture side. Once you have watched them through once, You need to go to a site called VideoNot.es (button is below) and make yourself an account. It allows you to take notes from videos in a really really user friendly way. TASK TWO: Choose your area of interest and watch the video I have provided for you and create the first of your notes on this topic. TASK THREE: Explore the vastness of Vimeo, TED and Youtube for video that adds to your understanding of your topic. Make some notes on it and then share that file with me. You got your green eyes from your mother, and your freckles from your father. But where did you get your thrill-seeking personality and talent for singing? The nature versus nurture debate is one of the oldest issues in psychology. The debate hinges on the relative contributions of genetic inheritance and environmental factors to human development. • For example, when a person achieves tremendous academic success, did they do so because they are genetically predisposed to be successful, or is it a result of an enriched environment? Today, the majority of experts believe that behavior and development are influence by both nature and nurture. However, the issue still rages on in many areas, such as in the debate on the origins of homosexuality and influences on intelligence. • Ultimately, the old argument of nature vs. nurture has never really been won. We do not yet know how much of what we are is determined by our DNA and how much by our life experience. But we do know that both play a part. Fast-growing understanding of the human genome has recently made it clear that both sides are partly right. Nature endows us with inborn abilities and traits; nurture takes these genetic tendencies and molds them as we learn and mature. • End of story, right? • The "nature vs nurture" debate still rages on, as scientists fight over how much of who we are is shaped by genes and how much by the environment. • Scientists have known for years that traits such as eye color and hair color are determined by specific genes encoded in each human cell. The Nature Theory takes things a step further to say that more abstract traits such as intelligence, personality, aggression, and sexual orientation are also encoded in an individual's DNA. • The search for "behavioral" genes is the source of constant debate. Many fear that genetic arguments might be used to excuse criminal acts or justify divorce. • The most debated issue pertaining to the nature theory is the exsistence of a "gay gene," pointing to a genetic component to sexual orientation. ᾿ You were born that way῀ . • While not discounting that genetic tendencies may exist, supporters of the nurture theory believe they ultimately don't matter - that our behavioral aspects originate only from the environmental factors of our upbringing. Studies on infant and child temperament have revealed the most crucial evidence for nurture theories. • Give me a dozen healthy infants, well-formed, and my own specified world to bring them up in and I'll guarantee to take any one at random and train him to become any type of specialist I might select...regardless of his talents, penchants, tendencies, abilities, vocations and race of his ancestors. • early experiments produced pigeons that could dance, do figure eights, and play tennis. Today known as the father of behavioral science, he eventually went on to prove that human behavior could be conditioned in much the same way as animals. • If environment didn't play a part in determining an individual's traits and behaviors, then identical twins should, theoretically, be exactly the same in all respects, even if reared apart. But a number of studies show that they are never exactly alike, even though they are remarkably similar in most respects. • Researchers on all sides of the nature vs nurture debate agree that the link between a gene and a behavior is not the same as cause and effect. While a gene may increase the likelihood that you'll behave in a particular way, it does not make people do things. Which means that we still get to choose who we'll be when we grow up. • Who might be most interested in resolving the nature versus nurture debate? • What effect might a resolution have on our society? • If you were raising identical twins, what might you do to make sure that they were unique individuals? • Gathering knowledge and understanding is a good thing but we need a bit of humility - we are not just a collection of genes. • We have a tendency to attach a kind of quasi-religious significance to our DNA, to be more deterministic than we should. • It's a concern that the importance of environmental influences will be lost in the fanfare about genetics. • Could a given gene can be the cause of crime, homosexuality or even sporting brilliance? • Are you born evil or could anyone be trained, given the right environment?